Hello, this is the RPG Crawler, and welcome to another oldschool game system review. This time I’m covering Low Fantasy Gaming, by Stephen Grodzicki, a system available as a free pdf from https://lowfantasygaming.com/ or as a softcover from lulu on demand printing for a paltry fee. The low fantasy gaming site does have links to adventures available through their $1 adventure framework patreon, so if you decide you like the system, be sure to return to their site to see if that’s of interest as well. Now, onto the system itself. I will be using the freely available pdf for this review. The PDF is 184 pages, from cover to legal notice at the end, and fully bookmarked for easy navigation. It is done in a subdued color scheme with black and white art. Design follows a two column scheme throughout, with appropriate non-wrapping breaks for images and tables. And there are a lot of tables. The writing is closer to British English style than American English, though the distinction is never truly a problem, as it never verges far into territory where the linguistic differences are all that evident. Indeed, the writing is quite solid and concise, with rules clearly explained without getting too pedantic, and where there is some ambiguity it is intentional, as this is supposed to be a relatively rules light system. We’ll see just how well it approaches that goal later on. An interesting bit to note is that many tables within the rules are simply guidelines or there for inspiration, and as such may have specific references that should be substituted on the fly. For instance, one of the entries on the random treasure tables is ‘Title deeds to Ironcliff Keep on the Isle of Abusi,’ which will clearly need to be altered to something more appropriate to a particular game master’s campaign. Aside from these references and inspirational entries, the core book doesn’t actually detail any settings, but rather presents a stand alone rule system. The rules themselves use the Open Gaming License and incorporate many concepts, classes, monsters, spells and so forth that you would see in various retro clones, but this system is distinct from many of those clones. It does not use a straight d20 system. While combat uses a pretty standard d20 + bonuses vs. AC sort of set up, skill use and attribute score checks use something more akin to the old proficiency and attribute checks from Advanced Dungeons and Dragons, where you roll a d20 and try to get the listed attribute score or lower, perhaps with some modifications. Low Fantasy gaming starts with a quick explanation of what Low Fantasy Gaming is, and in this ruleset’s case, that means adaptable rules, quick and dangerous combat, the idea that magic is rare and dangerous to use, and a focus on a relatively realistic world. This is done through a limit on character levels, with twelve being the maximum, a consolidation of the classes into just five, a readjustment of the ‘standard ability scores’ we’ve come to know from these adaptations, an adjustment of the combat system itself, and the existence of exploit mechanics to allow for truly impressive combat maneuvers. Character creation goes through the usual steps of rolling attributes, selecting a class, picking some skills, but before you roll for starting gold you’re also expected to create a short background and roll for starting bonds with the rest of the party. While party bonds have little direct non-roleplaying effect on the game, backgrounds can be used to determine whether certain activities that aren’t covered under the core group of skills benefit as if they were actual skills. You’ll also note that you do not choose an alignment. Low Fantasy Gaming does not use an alignment system. So the first step, after choosing a name, is to roll up attribute scores. Low Fantasy Gaming uses seven core attribute scores, plus Luck, Of the core seven scores you have Strength, Dexterity, and Constitution, then Intelligence, Perception, Willpower, and Charisma. The usual ‘wisdom’ having been replaced with Perception and Willpower. Using the core method, you start with an automatic 15, then roll 4d6, dropping the lowest, six times to get seven numbers, then assign them as you wish among the seven core attributes. There are a few alternate methods listed. The system uses a spread similar to 3rd edition and pathfinder for bonuses. Characters also start with a Luck attribute, which starts at 10 + half the character’s level at the start of each adventure, then gradually decreases as their luck is tested. A luck check is done similarly to other attribute checks, where a d20 is rolled and modified for the situation, and if it is equal or lower than the luck score, it succeeds. However, succeeding on a luck check reduces the current luck score by one, although luck can be restored during a long rest or at the beginning of another adventure. The luck mechanic replaces saving throws from other d20 systems, and a luck check might be modified by a particular attribute, for instance a trap may call for a dex based luck check, which applies any modifier the character has from the second ability to their luck score for the check. Now I’ve seen luck mechanics similar to this in other games and I have to say that I kind of like the idea, since it does imply that a hero’s luck can be stretched only so far, which is actually a bit of a common theme in some sword and sorcery fiction. Classes follow a similar theme to 5th edition classes actually, with each one gaining a number of abilities as they level up. However, that level range is much smaller than most modern systems, with a level cap set at 12. The available classes are Barbarian, Bard, Fighter, Magic User, and Rogue, and they generally do what you’d expect them to do if you’re familiar with any sort of fantasy rpg. You should note the complete lack of clerics and similar priest classes, which seems to have been done for a number of reasons, not least of which is that, thematically, most ‘priests’ in low fantasy settings rely less on the blessings of a divinity and more on either raw muscle like any other warrior or on dark magical pacts, which fits the Magic User. Healing spells, such as they are, have been rolled into general Magic User spells. There is also a lack of multiclassing rules, however each class gets among their other abilities, a set of ‘Unique Features’ at 3rd, 6th, 9th, and 12th level which can be used either to give the particular character an ability customized for their background and development, or to implement a bit of multiclassing by borrowing from other classes. This rule is optional and can be replaced with an attribute score increase instead, but I actually kind of really like it. It’s definitely more work on the GM’s side, but it allows for a fair degree of personalization, especially within the context of these rules, without inflating the game with masses of feats which all have to be carefully balanced to prevent exploitation. At least this way, if an ability doesn’t work out, the GM will be within their rights not to allow it again. Skills operate on a simplified list that seems derived from the fifth edition one, with each skill having an associated attribute that it relies on. A character’s class determines how many skills they get, and training in a skill grants a +1 bonus to the attribute checks based on that skill, as well as access to a reroll pool. The reroll pool is a nice touch, with a character starting with 1 reroll pool die per level at the start of an adventure. During that adventure, if they fail a skill check or a luck check, they may use one of these die to reroll it, or in the case of a roll with advantage or disadvantage, reroll one of the dice. Yes, this system uses the 5th edition advantage and disadvantage rules. They work rather well and I have no complaints about that. Moving on to Races, although the default presumption is that almost all characters will be human, there are rules included for dwarven and elven characters, in the event that the GM is using them. Are they balanced? Mmm, kind of? They aren’t terribly overpowered, and their weaknesses are glaring enough that I would still see them being relatively rare even in a game that used them. Equipment follows a rather similar arrangement to a lot of osr games, but rather than listing prices for every little thing, most gear is broken down into rarities, and then each rarity level is given a random gold spread. For instance, each item under the ‘common equipment’ rarity costs 1d6 gp, while rare equipment costs 5d10 + 50 gp each. Almost everything except for weapons and armor (which are a constant value each) and truly expensive items such as vehicles and buildings, are treated in a similar manner. Even the truly expensive items simply list a ‘minimum cost’ rather than a hard number. It’s kind of neat, and adds an element of unpredictability in pricing. So I’ve discussed the basic skill and attribute use rules, and the basics of combat are very similar, with heavy inspiration from fifth edition, but one particular mechanic bears mentioning. Martial Exploits are divided into two categories, minor exploits such as disarming or dirty fighting and the like, and major exploits, such as impaling someone’s limb to a wall with a spear or crushing multiple foes together. These are really open ended, and use a variety of different checks, with basic attribute checks used for minor exploits, and luck checks after a successful attack roll used for major ones. It seems like it would make for a fair amount of variety in combat, without having to provide a minutia of minor rules for dozens of situations. Injury is handled with a few special rules. Having half or less of your hit points results in the staggered condition, which can open a character up to different abilities, while being dead or not dead on falling to below 0 hit points is checked at the end of combat. A character is either ‘all dead’ or ‘mostly dead at the end of a combat, with ‘mostly dead’ characters likely having to roll on an injuries and setback table, which can result in long term or even permanent injury. This table is also used during special attack results from some weapons, or from exposure to some monsters’ attacks. Characters can take a short rest or a long rest. Short rests take a few minutes, while long rests take a few days, and both are generally accomplished on longer adventures. During a short rest, a character can attempt to recover hit points, class abilities, or reroll dice. This is not automatic, and there are will checks involved to do so. Further, only three short rests can be taken each day. A long rest automatically grants the recovery of a number of different things, including total recovery of class abilities, reroll pool, one point of luck, other attribute points and hit points. The magic system is interesting. Although the only spellcasting class is ‘Magic User’, items are built in such a way that there are ways for other classes to access spells. Which is a little odd, since the system is aiming for less magic overall, but it makes sense in a way. For one, the dangers inherent in magic use are very real, and at some point unavoidable. For another, there’s a certain literary history of warriors and rogues getting their hands on unknown devices, scrolls, and so forth, then running the risk of being overwhelmed by the dark powers they are untrained for. All characters in this system can attempt to detect the presence of magic within 30’ in an inexact manner, just by making an intelligence or perception check to pick up on the weird way their own instincts react. But a more important aspect of magic use in this system is the Dark & Dangerous Magic chance. Every single time a spell is cast, or certain magic items are activated, the character rolls a d20, and on a 1, the spell works but with a Dark & Dangerous Magic effect. If the roll succeeds without a DDM effect, then subsequent spells increase the chance of a DDM effect by 1 each time. So it’s nearly inevitable that at some point a caster will trigger an effect, unless they don’t cast all that much. The counter resets when an effect is triggered or when an adventure is completed and a new one begins. Some spells and items don’t care about this chance, and just automatically trigger a DDM effect. When a Dark & Dangerous Magic effect is triggered, The caster’s luck drops 1 point, and the caster has to roll on a big table with all kinds of weird and strange effects, some of which might very well have permanent impact! Some of them have good side effects, but even the good ones will mark a character as having played with forces beyond mortal control, and likely have serious roleplaying effects. The spells themselves include a lot of simplified versions of the spells common to most osr style games, with the notable exception of things like resurrection, teleport, and falsehood detection. The spells also cap out at level 6 due to the overall character level cap of 12. There are 20 spells per level listed, with a few clerical healing type spells mixed in. Although the lack of ability to raise the dead means that character death is a real threat and a permanent thing, the existence of the remove injury spells do somewhat mitigate the ‘injury and setbacks’ that can accrue on characters over time. The GM information section has some interesting snippets, with several optional rules including a chase system for running long distance chase scenes after combat, basic downtime suggestions, and a madness system that allows for long term effects from the stresses and horrors characters are likely to face. The level advancement systems given don’t rely so much on experience, but rather a de facto milestone system, where characters simply gain a level after each adventure, or gain one ability from a new level after each individual session. Not my favorite way of doing things, I must admit, but I guess it saves a lot of bookkeeping on the GM’s side. There are also basic rules for Morale and Reactions, in case a GM needs a little bit of randomization in what the monsters encountered do. Monsters too follow a simplified format, similar to what one would expect of older editions. Hit dice are back to just d8s for every monster, attack bonus is based almost purely on the monster’s hit dice, though some aspects were borrowed from later editions. Some monster abilities have a recharge condition, for instance. There are various monster ‘types’ that grant abilities across all monsters of a particular type, for instance Undead or Lycanthropes, but there is also a monster type called ‘Boss Monster’, which is basically a template that can be applied to any creature to render it into a challenge for an entire party. I kind of like how it’s handled, though I’d have to see how it works in actual play. Trap rules are mostly guidelines, with traps divided into two categories. There’s simple traps, such as your basic spring trap or trip wire, which can be detected and removed like traps might in any other game. Then there are ‘complex traps’ which are treated more like encounters and puzzles. This is another distinction I can appreciate, because there’s a hell of a lot of difference between finding and disarming a poison dart trap on a chest, and trying to deal with a rotating room with an active rolling boulder as it slowly fills with water. The latter should require some degree of teamwork and planning, more puzzle than trap, really. The final point I want to talk about before getting into my overall thoughts on the system is the treasure section. Rather than a number of keyed treasure types, random treasure is divided into just two sections. ‘Carry Loot’ represents items that are carried on not one creature, but an entire group of creatures. It is a roll on a table that gives a wide range of relatively portable results, ranging from just a few coins to supplies, jewelry, and such. Lair treasure is more straightforward. Each hit die level gives gradually more and more treasure, in the form of a possibility of a magic item, gold, or miscellaneous valuables. Magic items are where the game really begins to diverge from others of its sort. Though potions are largely the same as in other games, spell scrolls can actually be used by anyone, although with a significant chance of miscasting and triggering a dark and dangerous magic effect. Finally, there are the permanent items. They use an attunement rule similar to 5th edition, but other than that diverge sharply. Rather than having set magic items with set abilities, each magic item, be it weapon, armor, cloak, necklace, whatever, has a chance of discreet or obvious properties. Obvious properties are magical abilities of obvious effect. Things that cannot be ignored, like items that enlarge their user or shoot lightning. Discreet properties, the more common type, are things that aren’t immediately obvious to an observer. An item might be indestructible and confer upon its wielder some resistances, or grant them darkvision. Each magic item may have one of these abilities, regardless of the item type, and as the character levels up, the GM has the option to allow the item in question to gain more abilities. This option is designed to keep the number of items in check while still allowing for a variety of effects the character can count on. I’m not sure how well this may work, since it still ends up granting characters a variety of magical effects at the end of the day. Still, it’s an interesting concept, somewhat akin to weapons of legacy or something similar. There are a few other rules, underwater combat, some basic city and wilderness exploration things with encounter table examples that can be worked into full tables, but these are pretty typical of other OSR games. So… what’s the takeaway of all this? Low Fantasy Gaming, in my opinion, does what it sets out to do, and does it rather well at that. It makes for a game with a low to mid level of magic, yet doesn’t necessarily sacrifice character power. A character can still accomplish quite a lot with the abilities given to them, and feel like a real powerhouse, and I think that the risks associated with magic are just dangerous enough to limit overuse without making it a complete gamble to cast spells. I like the overall power cap as it were, with the lack of ‘flat bonus’ magic items and the hard cap at level 12. It seems that is about the range that the original versions of fantasy roleplaying games tended to start at, and for good reason. The format is very nice and feels professional level, and the rules themselves are cohesive enough that it feels very consistent throughout. There are a few minor awkward sections in the rules, for instance there are some mentions of situational bonuses and penalties on certain actions similar to what you’d see in a 3rd edition derived game, and those might interact oddly with the concept of advantage and disadvantage, and the reroll pool itself, at least in terms of a purely mathematical perspective. Still, the system overall is easy enough in practice, and those minor quirks don’t detract overall. 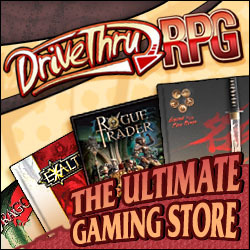 So considering the system’s price tag of free, the quality of the writing and the production value of the PDF, the flexibility of the rules and the way it really does deliver on the premise of a low fantasy environment without sacrificing the fun of character advancement, I can strongly recommend taking a look at this for anyone who’s at all interested in that genre. It’s a little bit more complex than a lot of ‘rules light’ osr games might be, but it uses that slight bump up in detail to very good effect. Honestly, I think I’d like to see some sort of expansion or secondary booklet that goes into stronghold building and mass combat, but that might be asking too much from the system. It seems like it’d work just fine without it. I'll leave it up for you to decide, links will be just below.